By Andrew Liszewski on 11/30/10 • Leave a comment! The holidays are traditionally supposed to be spent with family and loved ones, but I realize not everyone is lucky enough to have people to be with on Christmas day. So if the part of my brain that deals with emotions hadn’t been re-appropriated for sarcasm, I’d probably feel kind of sad thinking about the poor soul who has to carry around a credit card-sized pop-up Christmas tree. 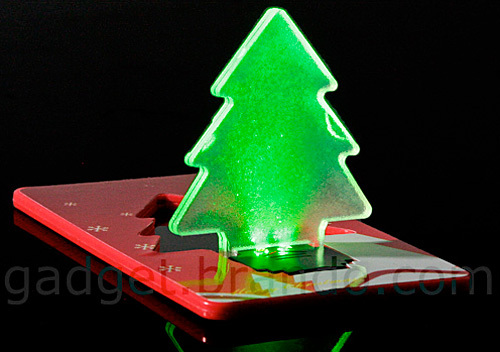 When folded down it’s thin enough to carry in a wallet’s card slot, and when popped-up the magic of internal refraction and LEDs causes the tree to grow a festive green color. Now all you need is a pop-up cup of eggnog and your loneliest Christmas ever will be complete. $10 from Gadget.brando.com. By Andrew Liszewski on 11/24/10 • Leave a comment! There’s a lot of crap and hard work that comes along with the holidays, so in order to remain in that festive spirit you need to cut corners wherever possible. Instead of decorating a tree I usually just leave my ornaments organized by color in a plastic container in my closet for all my other plastic containers to enjoy (I’m very giving that way) and instead of putting up lights in my windows, I’m switching to these illuminated Gel Gems this year. 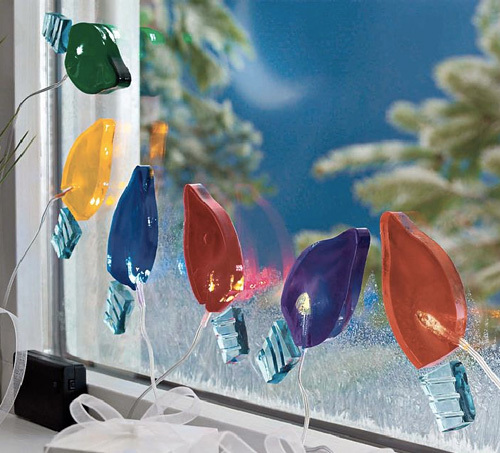 I’m sure everyone has seen these Gel Gems things before, they look like flat pieces of Jello that you stick to your windows to celebrate various holidays, and now they come with built-in LED lights. So instead of having to find some way to mount a string of lights around a window frame (which does lead to some level of fun when you break out the old staple gun) you can just stick these directly onto the glass. They’re powered by a small battery pack so you don’t even need to worry about overloading the nearest power outlet, and a set of 6 is available from Solutions for $14.95. By Andrew Liszewski on 11/18/10 • Leave a comment! Even though I love Christmas, at times I find the more commercial aspects of the holidays a little annoying. But I’ll never be annoyed as much as the person who finds themselves gifted with ThinkGeek’s Tannenbomb ($11.99). Hidden inside the silver geek-inspired ornament, which is adorned with traditional Christmas icons like robots and zombies, is one of their annoying sound devices that’s been tweaked to spread holiday cheer. When hung from the branch of a Christmas tree the weight of the ornament activates the electronicy bits inside, and after a while it will start to randomly emit one of four different sounds including beeping, mosquito buzzing, a Christmas cricket and an Elf giggle. The battery is designed to last for months and when removed from the tree the sounds will automatically stop. So when the Christmas decorations are packed away those mystery sounds will disappear until the holidays roll around again next year. Imagine decorating your Christmas tree without having to worry about running wires in a sea of thousands and thousands of prickly pine needles. Seems like a promise that’s too good to be true, and in this case I’m pretty sure it is. 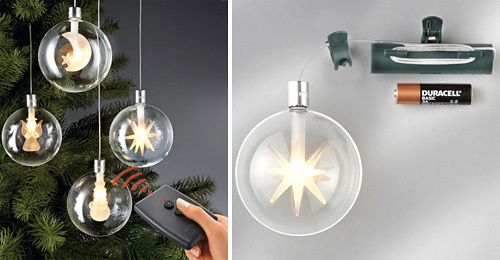 These wireless ornaments look like a clever enough idea since you just have to clip them to the end of a branch and adjust the height on the suspension cord as needed. And an included wireless remote lets you collectively turn them on or off from the other side of the room. But the system kind of falls apart when you consider that you’d have to decorate your entire tree with these wireless ornaments in order for them to be of any benefit. If you still need to string up wired lights in addition, then what’s the point? And not only will a set of 4 cost you about $79 (£48.95) which would end up being incredibly expensive to properly decorate an entire tree, but every single ornament needs its own AA battery. With 150 hours of battery life you could probably squeak through a single holiday season without having to swap them out, but I’m pretty sure this is an idea that’s still waiting for the proper technology before it’s actually practical. Halloween’s still a week and a half away but I’m sure the residents of that ‘Christmas lights’ house in your neighborhood, you know the one, are already hard at work planning and decorating for this year’s festivities. 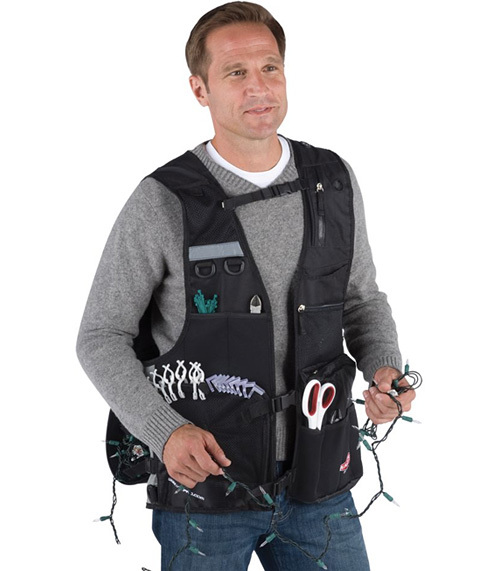 And since there’s already vests designed for fishermen, photographers and other trades, why not one designed specifically for “holiday lighting professionals” as Hammacher Schlemmer politically refers to them. Obsessed also works. The vest is adorned with pockets of all shapes and sizes, zippered and open, for holding tools, twist ties, bulb testers and whatever else a ‘lighting professional’ might need. But the real piece de resistance is the storage pack on the back which can hold up to 20 strings of lights, so you don’t need to keep climbing up and down a ladder to get another strand. But unless you’re making a living from doing this, or are desperate to outdo your neighbor, you might be hard pressed to justify the $79.95. By Andrew Liszewski on 10/08/10 • Leave a comment! Working in a home office can get a little boring at times, so ThinkGeek has once again come to the rescue with this pair of electronic blinking eyes from Japan that will allow you to anthropomorphize any inanimate object in your home to become your new best friend. They attach to almost anything via suction cups or hooks and the mechanical shutter mechanism stays synced between the two eyes at all times thanks to an IR signal. At three inches in size they’re probably better suited for bringing larger items like filing cabinets or fridges to life, and each eye is powered by 3xAAA batteries. $34.99, sold in a pair of course. No discounts for cyclops fans. By Andrew Liszewski on 10/01/10 • Leave a comment! Hooray! October 1st is finally here which means I can open the floodgates on crappy Halloween-themed gadgets for the 2nd best holiday of the year! Even though these days I don’t hand out candy, decorate, dress up or even go to costume parties, fond memories from my childhood coupled with giant boxes of miniature chocolate bars available at every store easily make this the best time of the year- second only to Christmas. So let’s get things started with an old favorite that’s gotten a spooky Halloween makeover. This Vampire Bat Hunt game is really no different than the interactive Duck Hunter we first brought you a couple of years ago at CES. Except that while some people might find ducks cute and think twice about shooting one down, no one’s going to hesitate when it comes to blasting this vampire bat out of the sky since they’ve gone to great lengths to make it as evil looking as possible. I mean it almost looks like a flying Gremlin! The gameplay and mechanics are pretty much the same as Duck Hunter too, requiring 3 direct hits from the infrared gun (which also doubles as the charger) to knock it out of the sky, and then presumably you’ll just need to stab a wooden stake through its heart to finish it off. 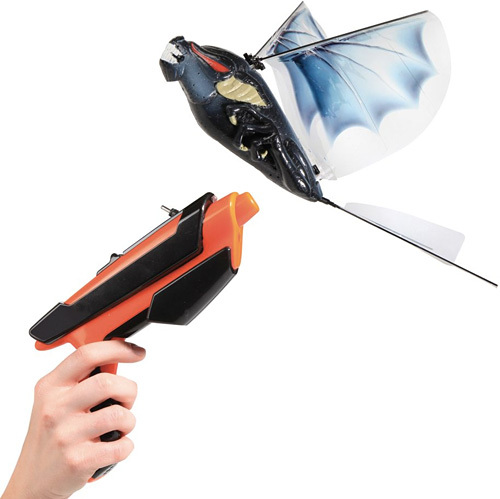 ~$30 from Hammacher Schlemmer. 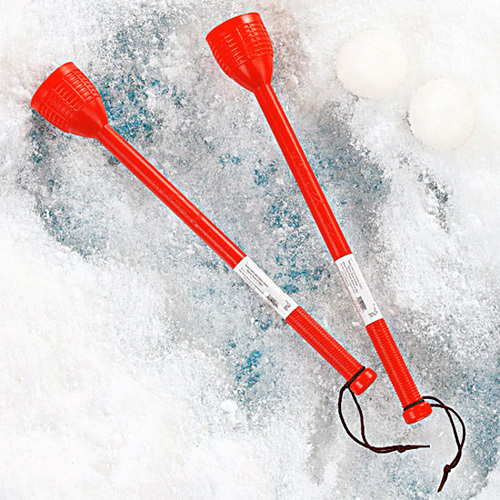 Step-up your snowball fight game with the double-duty Snofling. 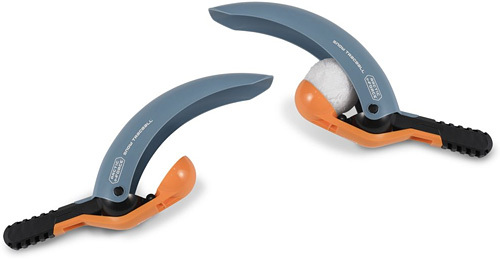 Not only is making snowballs with it as easy as sticking the business end into a mound of fresh powder, but it also doubles as a convenient launcher which keeps your gloves or mitts from getting soaking wet in the heat of battle. While I don’t imagine that aiming accuracy is one of its strengths, it makes up for it with a quantity over quality approach which can sometimes be just as effective. $5.95 from Amazon.